Cartoon isn’t only the territory of Disney. Russia surprisingly is quite an expert when it comes to animated motion pictures. Although they aren’t as popular as American-based Pixar movies, the animation does have a special place in the hearts of Russian people. Many would reminisce fondly the good old day cartoons from their childhood era. Russian cartoon is especially thriving during the Soviet era. Many Russians would recognize titles such as the Nu, Pagodi! or Vinnie Punkh which often frequented Russian TV on those days. The sixties to eighties is considered the golden age of Russian animation. Award-winning and globally popular big screen animations were produced in this era, such as Little Hedgehog in the fog, The Tale of Tales, and The Snow Queen. During the fall of the Soviet Union, the country was focused on rebuilding the newly formed Russian Federation. Animation world was hiding in the closet. It was not until around two decades later when Animaccord surprised the world with their wildly popular Masha and The Bear. The show is the most watched Animated movie on YouTube, garnering more than three billion views for one episode alone. Post-millennium cartoons aside, there are plenty of cartoon characters that stay in people’s heart, no matter what era they come from. Many cartoons are loved and regarded as a part of a childhood memory. These are some most loved Russian cartoon characters of all time. Vinnie Pukh is the Russian answer to Winnie the Pooh. It’s a character from the cartoon with the same name. But here Vinnie is portrayed in a different figure than Winnie the Pooh. If the American version is a cute and plump yellow bear, the Russian one is more realistic. 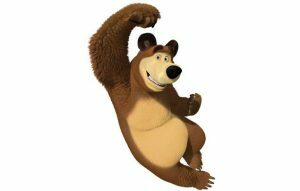 He is a brown bear, big and has a low baritone voice. In term of personality, both are also different. Can you imagine Winnie being bossy and ordering piglet around? If you can’t then you should try watching Vinnie Punkh. Vinnie is a bit mean and likes to order his friends around. Don’t worry though, underneath, he is a bear with a gold heart. The friends are also viewers’ favorite. Piglet is being piglet, a nice and loyal sidekick of Vinnie. Eyeore is always depressed and Tiger is always happy. The owl is wise, and in Vinnie Punkh it is a female instead of male. Together, the friends make an awesome team. Crocodile Gena and Cheburashka stole the heart of children back in Soviet days and continue to do so until today. It’s hard not to get smitten with their cuteness. Cheburashka is a creature of unknown species. He is small, resembles a monkey and has huge mouse ears. He is the Mickey Mouse of Russia. If you’re looking for souvenir while traveling in Russia, you can consider getting a Crocodile Gena or a Cheburashka doll to bring home. It’s easy to find them in many souvenir stores across the country. It makes more special and uncommon gift aside that the typical matryoshka. Check out other choices for souvenirs because Russia has plenty to offer. As for the place for shopping, there is a list of popular shopping malls in big cities like Moscow and St. Petersburg. Markets are also a perfect place to do some shopping, check out the lists of markets in Moscow here. 3. Wolf and Hare from Nu, Pagodi! A bit about Nu, Pagodi! is a cat-mouse cartoon themed from the Soviet era. A bit like Tom and Jerry in American television only with some crucial differences. First the character, it’s Wolf and Hare instead the cat Tom and the mouse Jerry. Second, the overall feel, the cartoon is very Russian at heart. Wolf is that typical Soviet badass man. He smokes a lot, which recently caused controversy among parents whether this cartoon is suitable for children or not. He has a rough voice and wears Soviet clothing. He’s cunning and will stop at nothing until the Hare is on his grip. On the other hand, Hare is a symbol of virtue and respectability. He’s the good guy of this cartoon. However, Russian children love both all the same. It’s just funny and entertaining to see their antics. It’s easy to fall in love with this 6-years old small and big-eyed little girl. Masha captures the heart of children both in Russia and abroad. Aside from being a popular uploaded video and YouTube, 12 countries and counting hold viewing rights for this cartoon. Every day, millions of children routinely watch Masha and The Bear. Masha is mischievous and a trouble-maker. She might be a little annoying but that’s because she’s a smart and curious kid. She’s also cute with her sparkly green eyes, blonde hair, and wearing traditional Russian clothing. She’s also very small in stature. She’s also funny. Her action is always hilarious to watch. She speaks with a bit of grammatical error here and there (you may take notes if you plan to learn Russian with this cartoon). Beneath all her naughtiness, she’s actually a kid with a gentle heart. The bear in Masha and The Bear is big and bulky, while also fluffy. Masha calls him Mishka, literally means “bear” in Russian. This bear is also interesting and a lovable character. He’s a retired circus bear, that’s why he is skilled in juggling and other acrobats. He may look scary from outside, but he’s gentle, nurturing, and has a big heart. He acts as a father figure to Masha. The wide-eyed little hedgehog is a lovable character. In the cartoon, he was lost in the fog. It’s easy to relate to his fear, curiosity, and wonder as he tried to get out of the mist. The whole movie can invoke so many emotions in your heart. It’s no wonder this movie received so many awards.